The peregrines started the day under overcast skies, with wind out of SW at 6MPH and temperature at 41°F. The forecast calls for scattered showers before 2pm, then showers likely and possibly a thunderstorm between 2pm and 5pm, then scattered showers and thunderstorms after 5pm. Some of the storms could produce small hail. Cloudy, with a high near 51. Southwest wind around 5 mph becoming calm in the morning. Chance of precipitation is 60%. New rainfall amounts of less than a tenth of an inch, except higher amounts possible in thunderstorms. This morning started off with the female rising up for a stretch and a walk to the edge of the nest box prior to departing and then returning minutes later. This is very normal first thing in the morning. When both parents are incubating, it makes a huge difference. This new male has been a very active part of the incubation process. 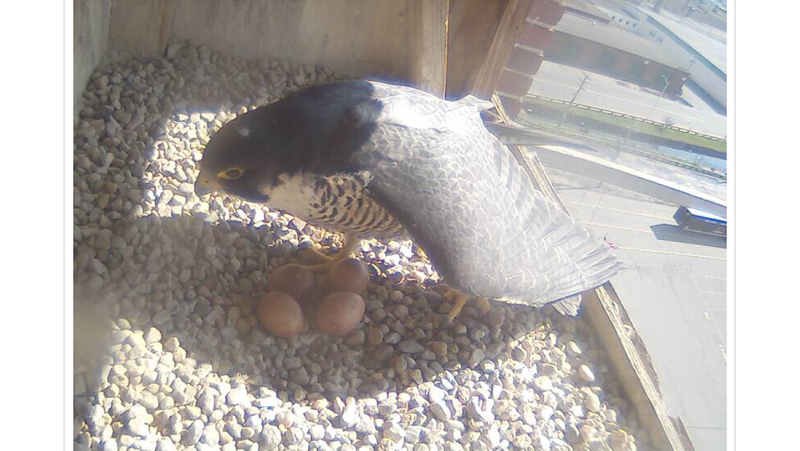 Normally, the male takes a smaller share in the overall incubation duties. 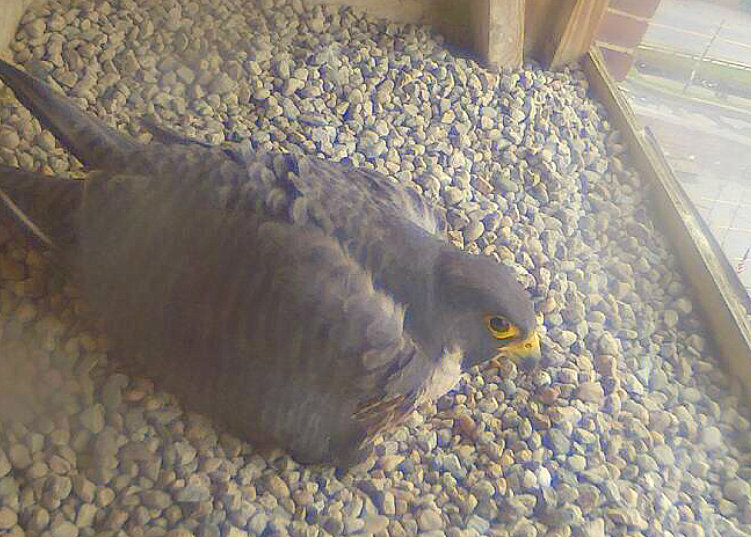 Most nights, the female peregrines will be on incubation duty. The male does most of the hunting for the pair during the incubation period. Often the male, with food, will call the female off of incubation to provide an aerial transfer of food, or, bring food to a nearby perch. Seldom does the male bring food to the nest. Lawrence Peregrines: shuffle & turn! The peregrines started the day under mostly cloudy skies, wind at NE 5MPH and the temp rising through 50F. Showers likely, mainly between 10am and 2pm. Patchy fog before 10am. Otherwise, cloudy, with a high near 57. Calm wind becoming west 5 to 9 mph in the afternoon. Chance of precipitation is 70%. New precipitation amounts between a quarter and half of an inch possible. A slow moving upper level system currently over the eastern Great Lakes is tracking eastward and arrived in New England overnight and will be in residence with us both today and Monday bringing cooler conditions with lots of clouds as well as the risk for showers from time to time. A rumble of thunder not out of the question this afternoon as the air aloft will be much cooler than the surface. Again this morning, the female shows how she shuffles and turns very carefully around the eggs, and then fluffs out feathers, while leaning forward and settling in on the eggs in an effort to match the brood patches and the eggs. The feathers become generally loosened and those of the lower back and the wing coverts are usually erected somewhat. * Scales appear on the lower legs. * The embryo continues to grow and move. * The ribs begin to ossify. Ratcliffe, D. 1993. The Peregrine Falcon. 2nd ed. Carlton, England: T. and A. D. Poyser. Lawrence Peregrines: preening & stretching! Just after peregrines awoke they found overcast skies with fog and mist, calm winds, and temp rising towards 50°F. The forecast calls for areas of fog before 7am. Otherwise, cloudy through mid morning, then gradual clearing, with a high near 70. Calm wind becoming southwest 5 to 8 mph in the morning. WOW…we had a great rebound in the afternoon with sunshine returning full force and temps topping out in the lower 70’s inland….WOW! 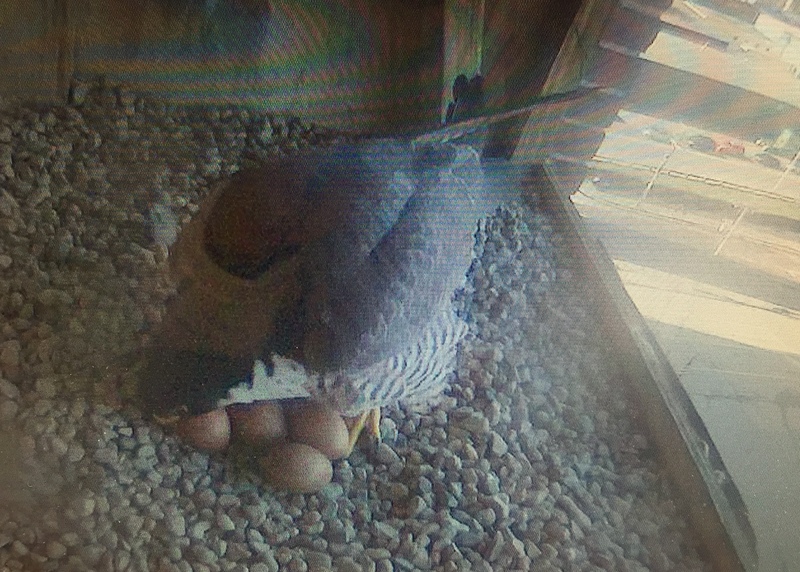 Incubating peregrines may turn at intervals during their time on incubation duty, rising up slightly from eggs to do so, based on space available. 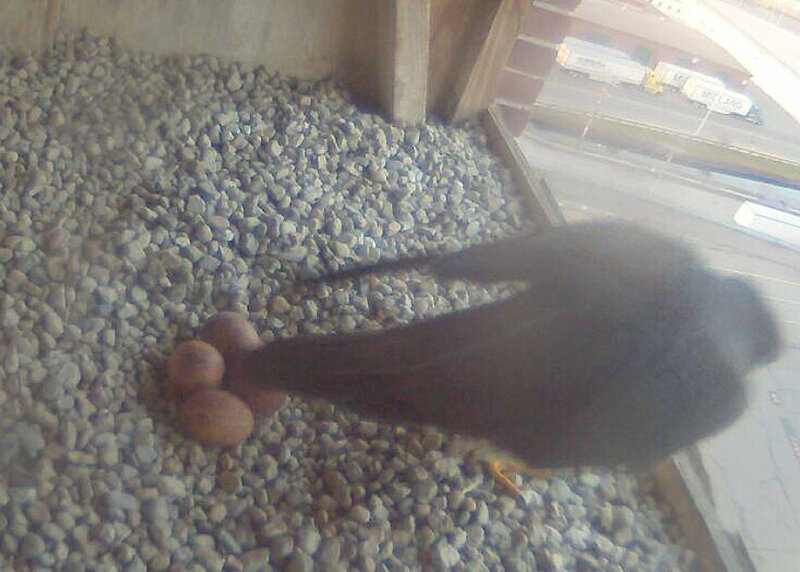 The bird will periodically move the eggs with its beak, usually by a backwards pushing and hooking motion which rolls the eggs against the feet, each other, or the small slope in the gravel. The sitting peregrine sometimes preens itself, and may partly rise or even leave the eggs for a short while to engage in more vigorous preening and wing stretching. 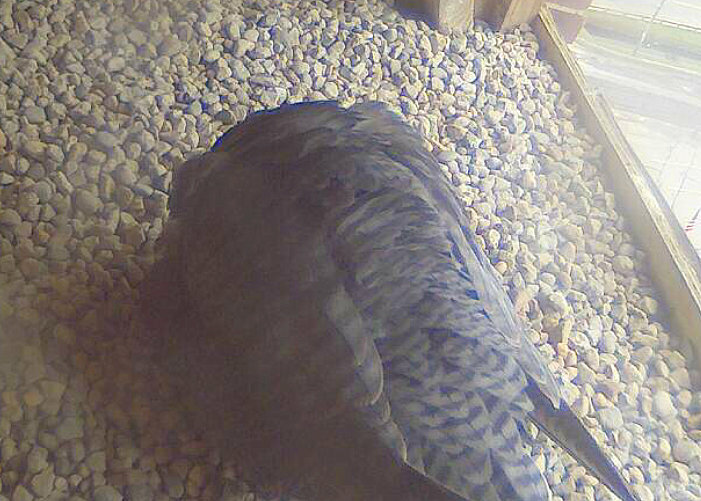 This afternoon the female spent a bit of time preening and wing stretching, while also making sure that the eggs were protected from the sun and heat! * The toe claws begin to curve downward. * The bottom of the feet become padded. * Feather germs on the back and tail appear as long, tapering cones. * The beak begins to harden. * The comb appears serrated. * The embryo begins to draw calcium from the eggshell for its growing bones. 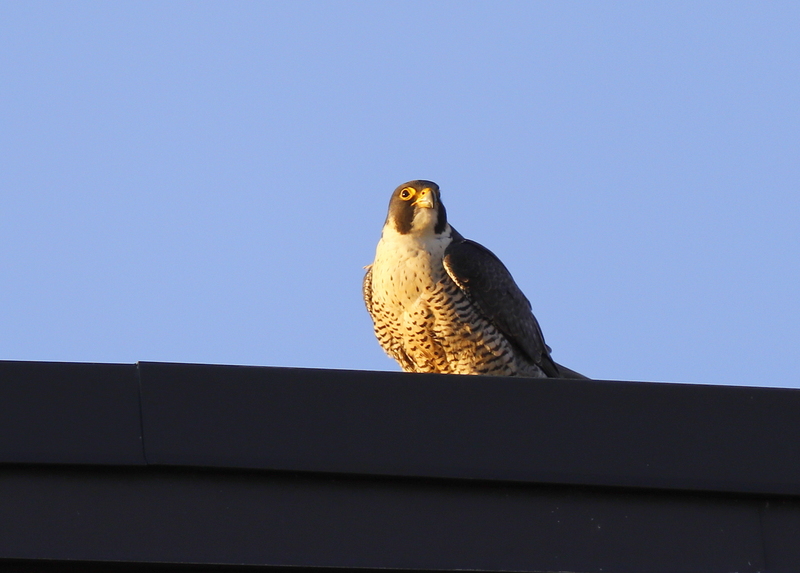 First thing this morning the peregrines had sunshine, little ind and temps at 49°F. The forecast for day ahead calls for a chance of rain between 1pm and 3pm, then showers likely after 3pm. Increasing clouds, with a high near 62. Calm wind becoming southeast 5 to 7 mph in the afternoon. Chance of precipitation is 60%. New precipitation amounts between a tenth and quarter of an inch possible. So we start off with sun, turning to clouds, and then rain! 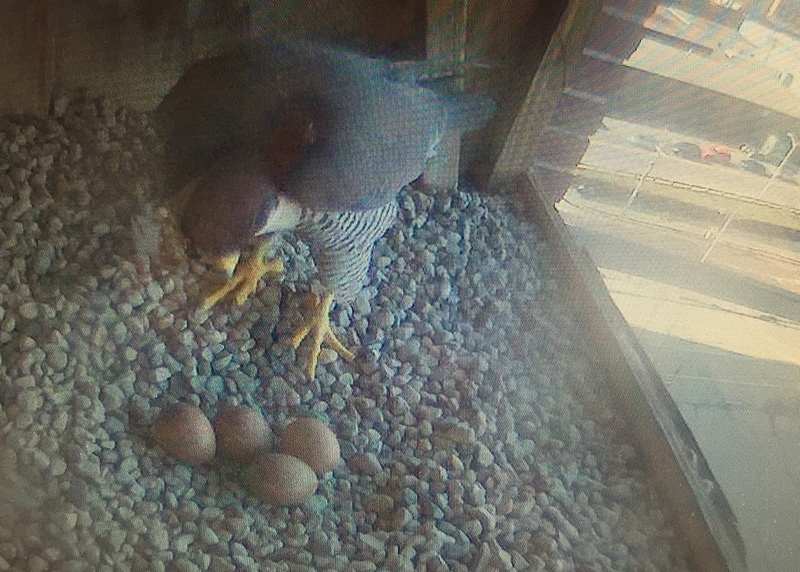 After my first watch, the male was on the eggs for over an hour, then just after 8:30 AM, the male departed and moments later the female entered the nest box, and settled right over the eggs, shaked a bit and that was it! * Talons begin to form. * Feather tracts appear over the sternum. Light Rain 56°F wind from SE at 3MPH. Sunrise time 5:46 AM. The forecast calls for showers likely, mainly before 8am. Areas of fog before 9am. Otherwise, cloudy, then gradually becoming mostly sunny, with a high near 67. Light and variable wind becoming west 9 to 14 mph in the morning. Chance of precipitation is 70%. New precipitation amounts between a tenth and quarter of an inch possible. 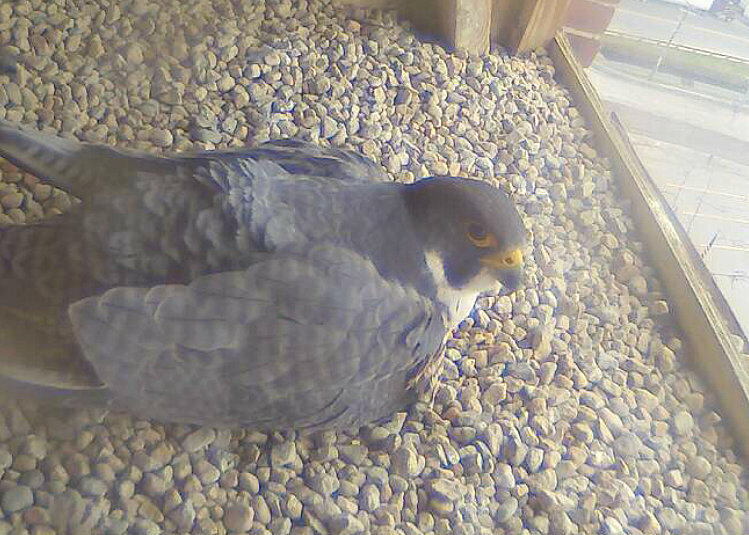 Checked in this morning just after 6:20 AM to find the male incubating. He was sitting quietly and barely moving. 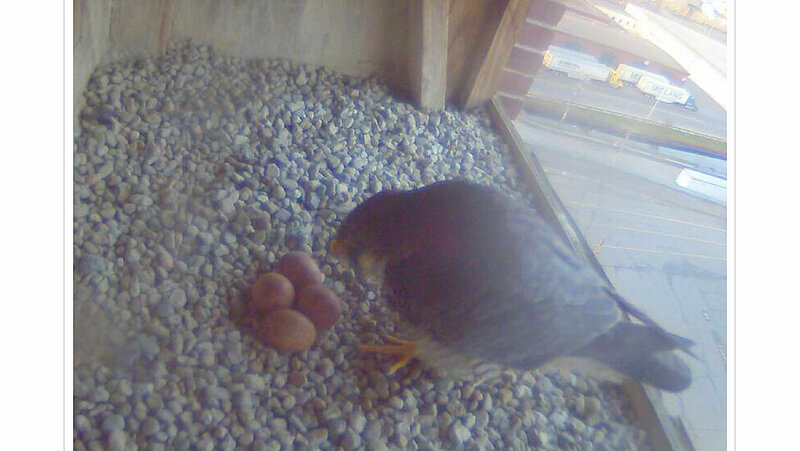 At 7:08 AM he departs, and returns minutes later, turns the eggs, shakes, rocks, and rolls, then nestles in on the eggs. At 7:14 AM the female flies in, and the male rises and departs. 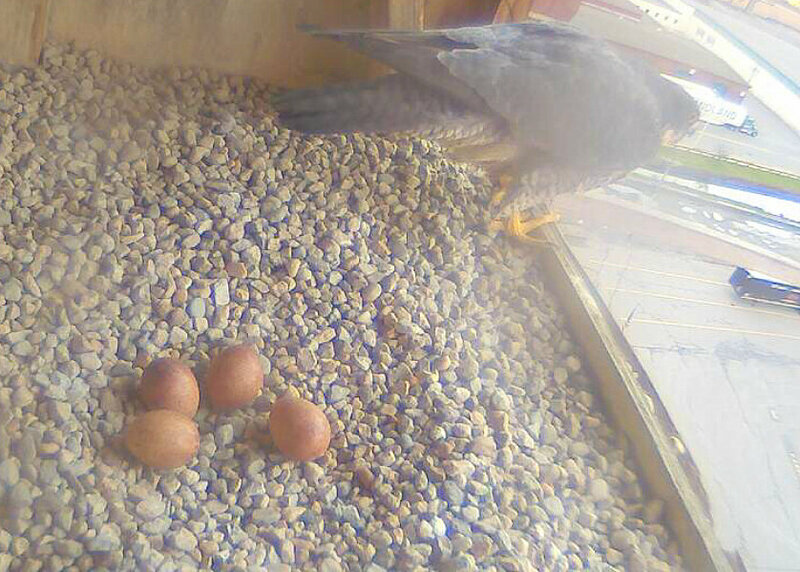 The female quickly settles on the eggs, engages in making low level chittering sounds along with active head turning. Ten minutes later she departs, and returns after ten minutes. Lots of in and out this morning. If you watch closely, you regularly see either adult get up, move around, then settle back down on the eggs. Sometimes they do this just to get into a different position, and maybe to give their legs a bit of a stretch, but often what they’re doing is turning the eggs. They turn the eggs to ensure that they get evenly heated. If the eggs aren’t heated evenly they may not develop, or they may develop abnormally. It’s also possible for the developing egg to stick to the inside of the eggshell. Turning the eggs keeps the egg membrane from sticking to the sides of the shell. 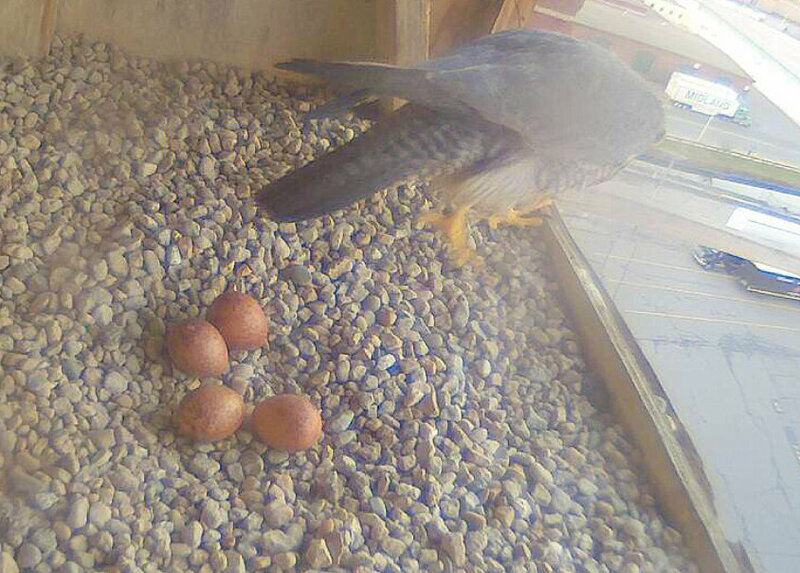 Falcons turn the eggs using their bills and their feet. As you can imagine, they turn their eggs very carefully! 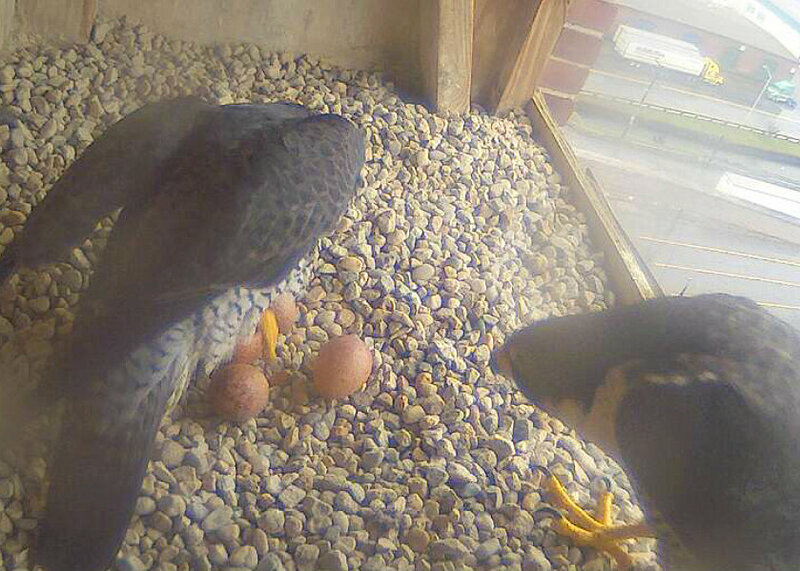 If you’re watchful and lucky, you may get to see a picture of them turning the eggs. It may look like they’re stepping on the eggs or pecking at them, but now you know what’s really going on. Turning is an essential for successful hatching of avian embryos. One of the most important roles of incubating parents, is to turn the eggs in the nest box. Regular turning of eggs is known to be critical for normal development. The most common explanation is to prevent the embryo from adhering to the inner shell membrane. 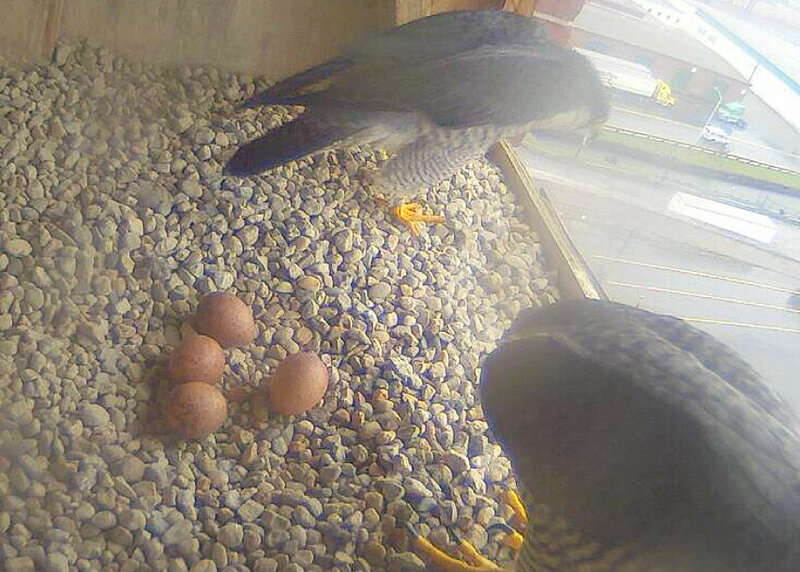 Imprints Blog, The Journal of the Rfalconcam, Rochester Falcon Cam. The Genesee Valley Audubon Society is the local chapter of the National Audubon Society in Rochester, NY. GVAS sponsors the Rochester Falconcam (Rfalconcam) as part of their education and awareness programs. 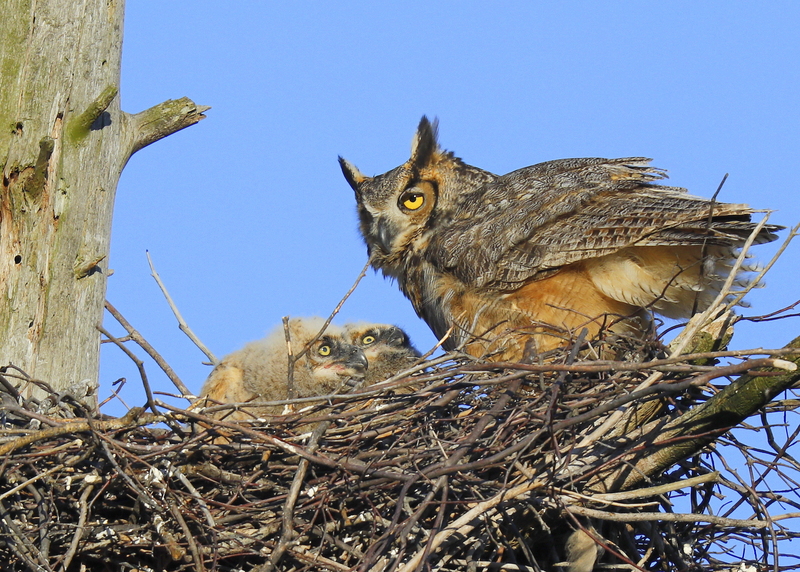 Great Horned Owl and owlets! Under clear blue skies and beautiful late day sun, winds form W at 13MPH and gusting up to 25MPH, had nice looks at female Great Horned Owl and two owlets. They were keeping a close eye on a nearby Raven that was making loud threat vocalizations and strafing the nest but from a distance. It caught the full attention of the female, and whatever the female watches, the owlets pay close attention. Only when an owl nest is left unattended or an adult is driven from the nest by human activity is there predation on eggs and nestlings by crows or ravens. Here is a quick framework of growth and development. 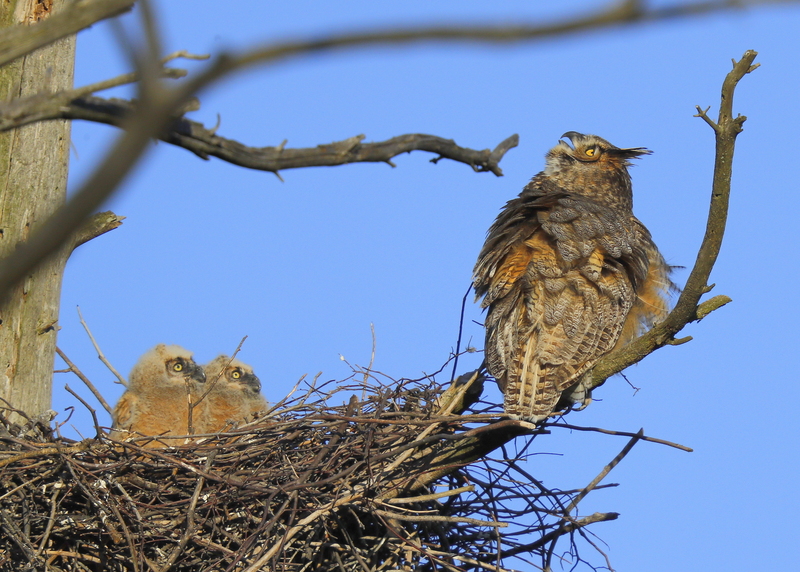 Owlets exhibit hostile behavior at approach of nearby intruders by 15 days: hisses and sways from side to side, claps bill and raises wing stubs. By 19 days, capable of exaggerated head movements while observing objects. Curiosity fully evident by 21 d; grasps objects in nest with toes and nibbles them. Able to feed self by 20-27 days (although female may continue to feed nestlings through 5th wk). Drops pellets after third week, and defecates in nest until about fourth week; thereafter attempts to eliminate over edge of nest. Able to climb well by 40 days, at which time young may leave the nest and clamber out along a tree branch or along a ledge. Young fully feathered and capable of flight by 45-49 d.
Had a nice look at the female peregrine outside the box tonight. She had been perched up on the Clock Tower, departed and made a couple of large aerial loops and then settled on the west wind rooftop of the New balance building in beautiful late day sunlight. The wind was strong from the west at 13MPH and gusting up to 25MPH with temps in low 60’s. Sunrise time this morning was at 5:45 AM. The peregrines awoke to overcast skies and light rain, no wind, and temp at 53F. From WHDH weather: the last three days have been phenomenal spring days for us!! While today we bring back soaking rain into the mix, we do still hold onto a pleasant weather pattern this weekend into next week. This morning we saw a batch of widespread rain showers, but late morning many of us are catching a break from the steadier rain with scattered showers. This doesn’t mean we’re through the soaking weather yet though, so keep that rain gear close by. We’ll grab another round of steady & heavier rain this afternoon & evening with downpours likely. We could also deal with a few thunderstorms capable of bringing downpours and gusty winds. 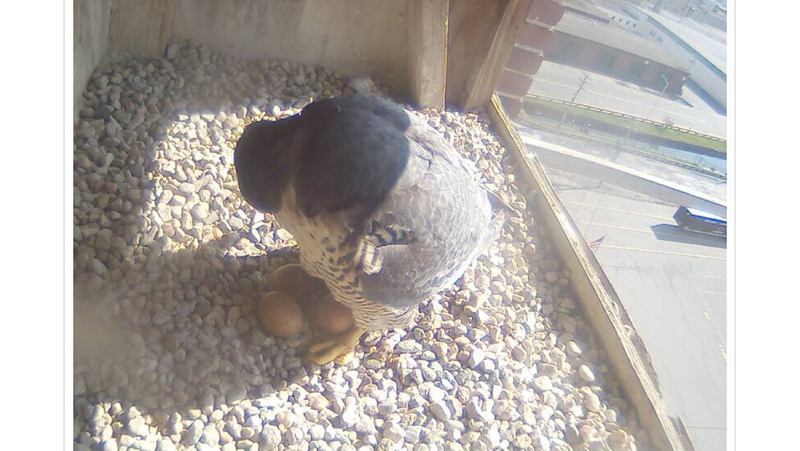 At 5:42, the female had been incubating. She rose up and headed out in flight, but for just a few minutes, and returned. A minute later the male popped in and left. Just after 6 AM, the female went out again for a quick trip and returned to shuffle around and then settle into incubation mode. * Upper eye lids begin to cover the eyes. * The knee caps begin to form. This morning, again, clear skies, bright sun and temperature at 43°F. The forecast calls for lots of sun, with a high near 70!! Light southwest wind increasing to 6 to 11 mph in the morning. 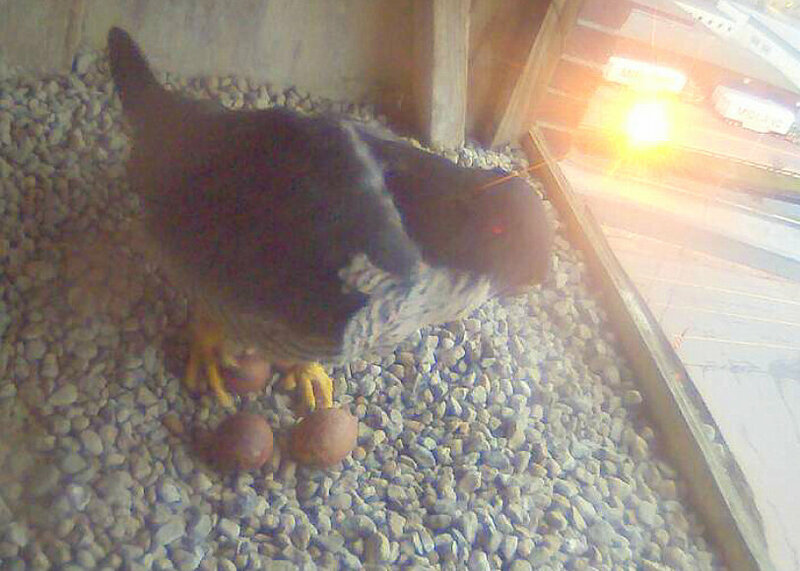 At 5:39 AM, the male had been incubating the 4 eggs. He lifted himself up, and off the eggs, walked over to the edge of the nest box, looked out for a moment, and returned to incubation mode. He then spent quite a bit of time doing his normal shuffling and adjusting on and around the eggs. * Three rows of feather germs are visible on the tail. * The nictitating membranes (inner eye lids) begins to form. * The egg tooth begins to form. * The bone marrow cavity of the femur begins to form. Until now the skeleton is made up of cartilage. The proces of ossification is beginning from day 12. Ossification is the process of bone formation, in which connective tissues, such as cartilage are turned to bone or bone-like tissue. The ossified tissue is invaginated with blood vessels. These blood vessels bring minerals like calcium and deposit it in the ossifying tissue. Bone formation is a dynamic process, with cells called osteoblasts depositing minerals, and osteoclasts removing bone. This process, termed bone remodeling continues throughout life. Lawrence Peregrines: male from female? Clear skies, bright sun, light wind from the south at 3MPH, and temp just after sunrise at 36°F. Monday morning forecast calls Sunny, with a high near 65. Calm wind becoming south around 5 mph in the afternoon. One question that has come in from many watchers….how to tell the female and male apart? 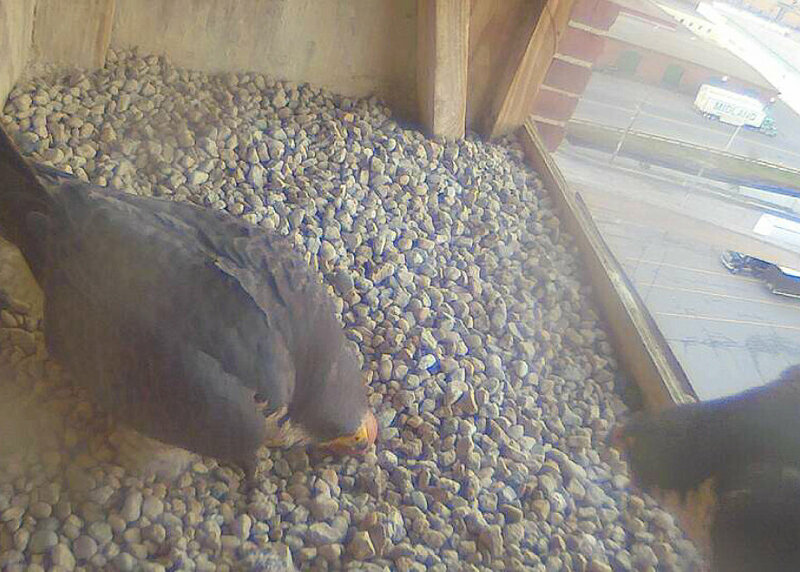 Literature cited: Imprints Blog, The Journal of the Rfalconcam, Rochester Falcon Cam. The Genesee Valley Audubon Society is the local chapter of the National Audubon Society in Rochester, NY. GVAS sponsors the Rochester Falconcam (Rfalconcam) as part of their education and awareness programs. 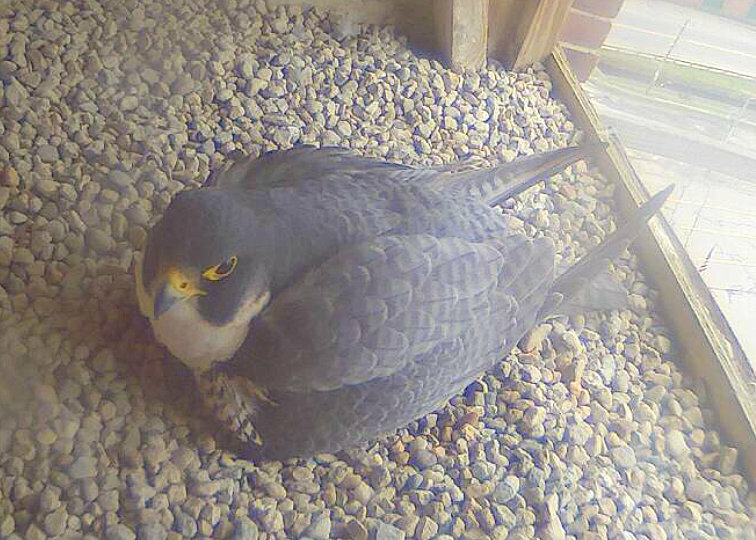 Lawrence Peregrines: almost a week!